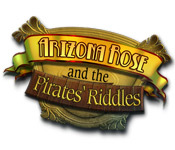 Arizona Rose and the Pirates' Riddles is rated 4.5 out of 5 by 76. Rated 5 out of 5 by kennyclark from not sure what type of game this is but i loved it i hope that someone can tell what this type of game is called because i'm addicted I WANT MORE. Rated 5 out of 5 by annettebrian from fun logic game i first time i played a game like this and loved it... hope they come out with more soon.. Rated 5 out of 5 by Wilbur69 from Great game!! I really enjoyed this game. I have recently played Arizona Rose and the Pharaoh's Riddles, it was not nearly as good. 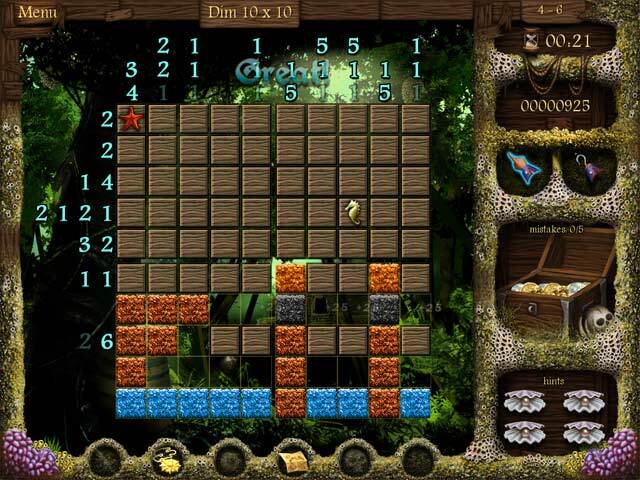 Rated 5 out of 5 by kassknits from Addicting Thanks to a mini-game in another HO, I delved into games like this and Fantasy Mosaics to understand how to solve the puzzle. I liked Fantasy Mosaics a lot and was happy to play it. Until I found Arizona Rose. This game is addicting. The game is essentially the same, but it's a whole lot better. The power-ups are an interesting way to help solve harder puzzles without using hints. Clearing empty tiles is easier and is visually cleaner to see the remaining game board helping keep mistakes at bay. There is a storyline and some HO to find before you start a level, which is a nice touch. I didn't know about Arizona Rose before I tried this game. Now I'm going to look at the others. Rated 5 out of 5 by Ziggy_Zigster from Riddle me this! This is a game genre I've never played before. I believe they call it 'mosaic'. 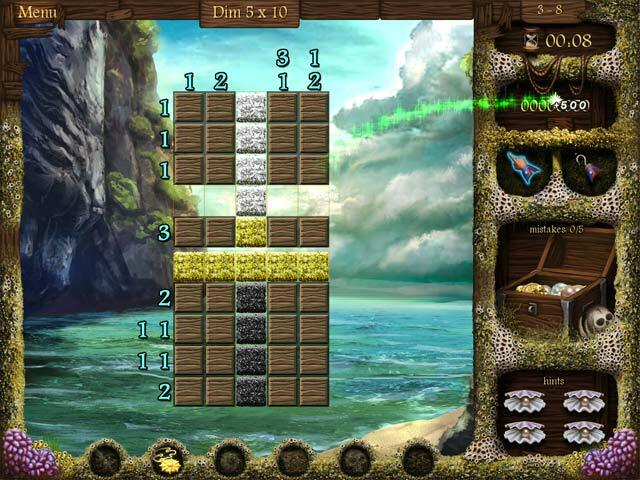 I was drawn to the game by the 'pirate' theme and in a quest for a different style of game. I found this game rather addictive. It reminded me a bit of the Windows game 'Minesweeper' in a sense. The game requires logic and deductive reasoning. It is a great and refreshing change from the usual HOP and TM games I usually play. I encourage you to try the demo. I'm glad I did. Rated 5 out of 5 by Fuphyter from A REALLY GREAT GAME! I never thought I liked this kind of game. I tried it playing this one and love it now. It's the perfect game to start "riddles" if you never have played before. There a lots of hints and options to help you along. I finished this one and tried another and wow, now I know how easy this was. I thought I just got better at a riddle game, umm no. On the new ones I mess up a lot, but I will keep playing them because now I love the games. Rated 5 out of 5 by nancyt2u from Very Fun Game I really like this game for one major reason. You don't have to start from scratch if you make too many mistakes. Sometimes I highlight blocks with the wrong mouse button so I destroy what I want to keep or keep what I want to destroy. If one makes too many errors you are out but if you go back to the map and say continue, the puzzle comes up again, right where you left off. You don't have to keep doing the same puzzle over and over again until you manage to get it right. The other thing I like is the fact that the blocks are colored and that makes the pictures more fun. There are little mini games when you change levels, kind of like Tetris. If you can't do this sort of puzzle the game has a skip button after a short amount of time. There is a quick H.O.G. too. There are a lot of levels for plenty of playing time. You get awards for finishing the puzzles, not for how fast you complete them or lack of mistakes. I don't listen to sound but the graphics are clear and easy to see. Rated 5 out of 5 by Pollysweet from Great and fun gme I love this game. I have only had it a short time and have played it over and over. It doesn't get old. Nice bright colors (important for someone who is visually impaired). 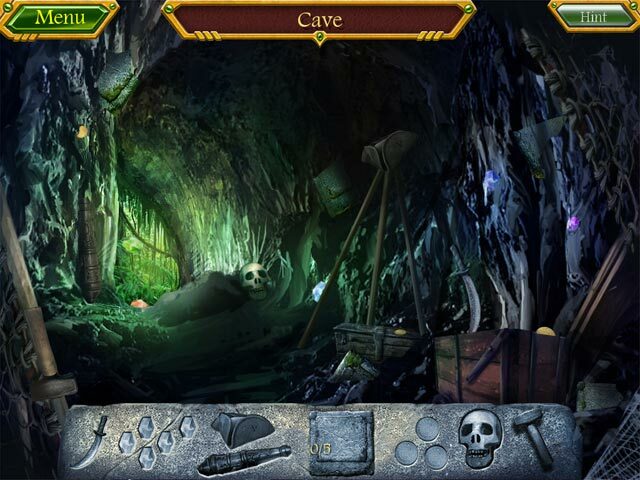 The hidden object mini-puzzles are rather dark but that is the only minus in this game. Rated 5 out of 5 by bluesycat from I LOVED this game!! Just wanted to say how much fun I had with this game. It took me a couple of months of intermittent play to finish. Well over 100 puzzles from 10x10 to 25x25. I played the easier mode and so much good times. There are also a few widely dispersed HOs, which are ok. Until the final levels, the music is pretty good - at the end, just annoying. I think this is the best of the games involving this kind of puzzle and I think I have them ALL. Only one big negative (and it might have been me and not the game). When I finished the last level, I wanted to go back and replay the levels that I had made mistakes on, trying for that elusive perfect score. It was either not possible to go back or I failed to figure it out. So I started a new game. If you enjoy this kind of puzzle, you're going to love this game. Rated 5 out of 5 by Katiendan from Best "Riddle" Game So Far I absolutely love solving the type of riddles in this game! It's similar to mine sweep, as you have to determine which squares are part of the puzzle picture and which are not - based on the numbers given for each column and row. This Arizona Rose game is different than the rest because it has a storyline to it - which added to the fun for me. I would highly recommend it!